Description: 130/70-13M 63P DUNLOP SX01 and 150/70-13M 64S DUNLOP SX01 manufactured in Thailand between January 2007 and October 2007 and fitted as a replacement and not as original equipment. Code DOT: 3PCN (150/70-13) or3PCWCA5M (130/70-13) and week numbers between 0407 and 4107. 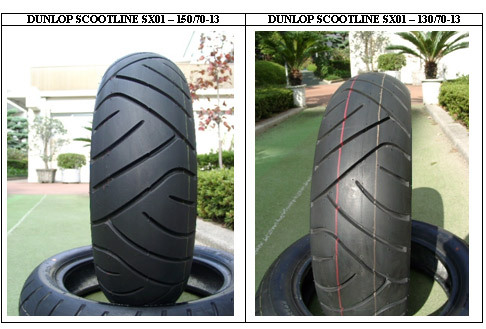 The product poses a risk of injuries because there have been a number of cases of separation of the tread during use (no case of loss of pressure has been reported). The first sign of this problem is vibration during use and it can lead to the tread being torn away. If the user ignores the vibrations and continues to use the vehicle, this can lead to loss of control or an accident, although no such incident has been reported as yet.